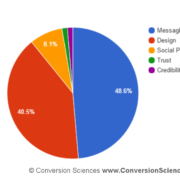 The BestPracticlopse may be eating your mobile conversion rates. Brian Massey and Joel Harvey have been making waves at conferences from Portland to Boston. Their presentations have been killing some of the sacred cows of mobile website design. Joel will be at it again this week in Las Vegas at Conversion Conference. Joel’s presentation on Mobile Design Essentials is going to be controversial, and how you treat mobile visitors is going to change as a result of what he has to say. The data is there to support some of their controversial positions. [pullquote position=”right”]Responsive design, as we know it today is toxic to mobile conversion rates[/pullquote]. High-performing mobile websites will look more like mobile apps. Maximizing screen real estate on small screens isn’t as important as we thought. Android and iPhone visitors act differently. You don’t really have just one mobile website. You have ten or twenty or thirty. Each operating system, browser and screen size generates a different interpretation of your site. Joel Harvey makes the point that if your site is broken, your visitors’ phone is broken. Joel was rated a top speaker at Conversion Conference in 2014. Join his session on Thursday May 14 at 10:30am and for a fun and enlightening presentation.